Today, Team Aquafly has more podium finishes and top 5 placements than any other Hydroflight Team in the World. Since 2013 our Athletes have consistently placed on the podium at all major competitions around the globe. Our Coaching Staff is dedicated to developing our Athletes into Champions through hard work and a proven training regimen. Anchored by Team Riders Jake Orel and Hunter Verlander, Team Aquafly will be hard at work training for upcoming competitions. You can watch them train most weekends at our Flight Center on Lake Travis from March through November. We welcome visitors and participants alike and if you're out to fly with us, you just might get a shot at flying with them! Ranked the #3 Hydroflight Athlete in the World by H2RO Magazine, Jake has been a solid performer at all major Hydroflight competitions since 2013. His unique style and flair make him a crowd favorite everywhere he goes. You can find Jake this summer at Sea World in San Diego performing in the Cirque de la Mer Show from May through August. Ranked the #1 Hydroflight Athlete in the World by H2RO Magazine, Hunter is the 2015 Flyboard World Champion and placed 2nd in the Pro Division at Hydro Fest in Las Vegas. He returns again to defend his titles and looks forward to the upcoming competition circuit. A native of Friendswood, Texas, Hunter trains every weekend at Aquafly on Lake Travis. A newcomer to the Hydroflight circuit, Logan has been flying for 2 years since he was 14. He placed 2nd in the Open Division at Hydro Fest in Las Vegas. He is a regular with our Show Team and he looks forward to upcoming competitions this year. 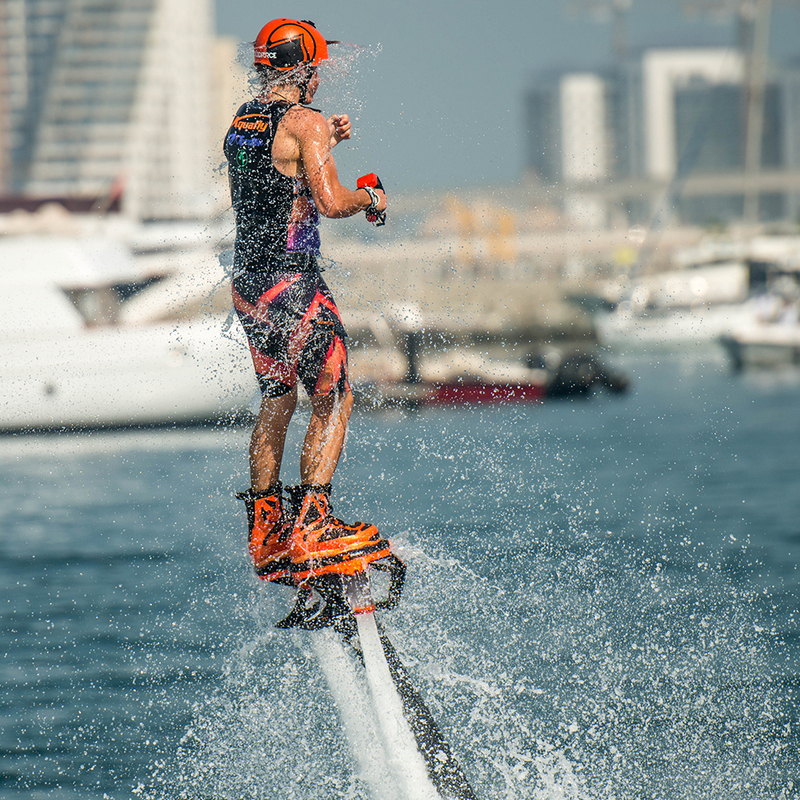 A fierce competitor in the Veterans Category, Todd won the 2015 and 2016 Championship Crown at the Flyboard World Cup. He has participated in Session One and The North American Championships where he placed 1st overall in the Veterans Division. Strength, style and determination best define Jason. As a member of the 2015 Aquafly World Cup Team, he placed 5th overall in the Pro Division behind teammates Hunter Verlander, Jake Orel and Damone Rippy. Our only female Team Rider, Valentine is one of the most graceful and beautiful Riders in the World. Her tall stature and bold moves are unmatched by any other female Rider and her passion for the sport shows in her riding style. She placed 4th overall in the Women's Division at the 2015 World Cup. 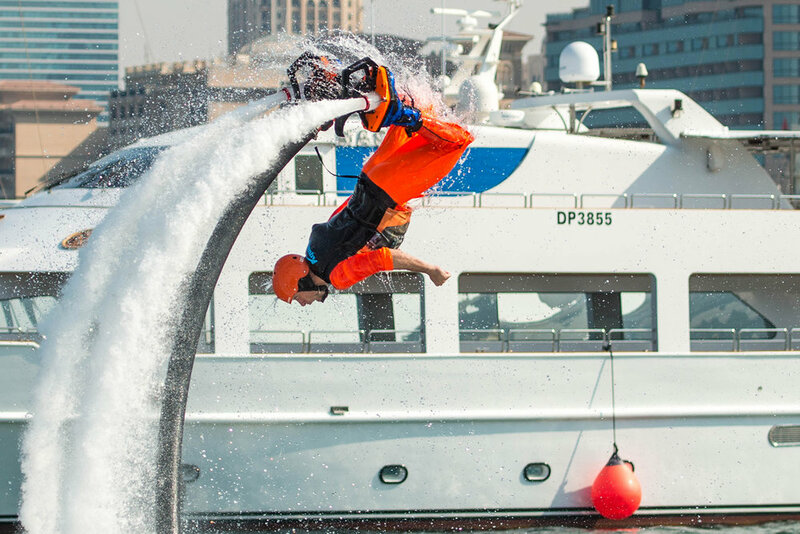 One of the original Team Aquafly Riders, and currently flying with the Flyboard Show Team in China, Damone won the North American Championship with Team Aquafly in 2014 and 2015. He consistently places on the podium in competitions and was a part of Americas Got Talent in 2015. One of the most powerful Veteran Riders we have ever seen, Brandon brings both style and flair to his riding style. He is also one of the most passionate Riders on the Veterans Circuit. He was a member of our 2015 World Cup Team where he placed 5th in the Veterans Category. One of the most passionate and inventive Riders on our 2015 World Cup Team, Rush wowed the crowd with his unique 'Universal' and 'Infinity' tricks. Placing 12th overall at the World Cup, Rush is a consistent competitor and a threat to win it all. If you are a seasoned Hydroflight Athlete and are ready to take your skills to the next level, contact us for an interview. Interested in sponsoring our Riders? For Corporate Sponsorship opportunities, contact a Management Team Member at (512) 435-9555 for details. Hunter Verlander, Timeshift from Stratospheric Industries on Vimeo.